The last time Hot Toys released a Black Widow figure, we were understandably amazed/petrified at the company's ability to practice the dark arts presumably required to create their exquisite toys. But now they're back with Johansson's soul in tow for a second outing, and she looks great. The 1:6 scale Widow, based on her appearance in Avengers: Age of Ultron, is largely similar in sculpt to the figure created for The Winter Soldier, but with both a new stealth suit covered in blue lights (alas, they don't light up) as well as a new haircut. To be perfectly honest, I prefer this version of Natasha mainly because I like her shorter hair compared to the straightened style from TWS, but either way, you're still getting the soul-capturing accuracy that Hot Toys pride themselves on. I mean, just look at that. A great figure gets even greater! This time around Widow is packing much more heat than her previous figures. Alongside the new and improved Widow's Bite adorning her wrists, Natasha comes with a variety of hands fit to hold two stun batons, her trusty pistol, and 2 guns that I don't think we've actually seen in the footage from Age of Ultron yet. They're unhelpfully described merely as 'blasters' by Hot Toys, so there's no real way of figuring out what they are other than some fancy looking bits of tech. To complete her accessories loadout, she also comes with two 'electrified' pieces of plastic to recreate the effect of the Widow's Bite shocking the bejesus out of someone. Lovely stuff! 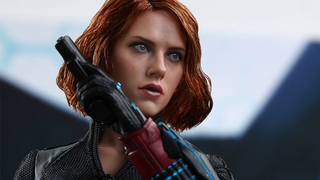 Black Widow will be available later this year, and you can expect the $230-300 price tag that Hot Toys figures usually demand. I'll update the post with a link to Sideshow's pre-order page when it goes live, but for now, I'd start getting some red in your ledger just so you can afford this wonderful figure.